In Matthew 1:18 it begins with the words "Now the generation of Christ was in this wise." In other words Matthew is saying, "Here is the way the birth of Jesus Christ happened." Then Matthew continues. "When as His mother, Mary was espoused to Joseph,"
You may ask, what does it mean that she was "espoused to Joseph"? There are two things that could happen before an actual marriage. They girl could be promised to a man or she could be espoused or betrothed to a man. Difference between a promise and a betrothal. A promise of marriage among the Jews of Bible times might mean an engagement without anything definite. There could be a number of engagements broken off. It was the betrothal that was binding, rather than a mere promise of marriage. The promise might be set aside, but a betrothal entered into was considered as final. Among the ancient Hebrews the betrothal was a spoken covenant. Later the betrothal included signing a written document of marriage. The Jewish betrothal in CHRIST's time was conducted thus: The families of the bride and groom met, with some others present to serve as witnesses. The young man would give the young woman either a gold ring, or some article of value, or simply a document in which he promised to marry her. Then he would say to her: "See by this ring [or this token] thou art set apart for me, according to the law of Moses and of Israel." The betrothal was not the same as the wedding. At least a whole year elapsed between the betrothal and the actual wedding. These two events should never be confused. Matthew continues: "before they came together,-[that is before they were married] -she was found with child, of the Holy Ghost. Whereupon Joseph her husband, being a just man, and not willing publicly to expose her, was minded to put her away privately." The Mosaic Law was very specific at this point, "What man is there, that hath espoused a wife, and not taken her?" (Deuteronomy 20:7). Two events are differentiated here: betrothing a wife, and taking a wife, in actual marriage. It was during this period of about a year, between the betrothal and the wedding, that Mary was found to be with child of the HOLY SPIRIT (Matthew 7:18). The Jews took this betrothal period so seriously that if the girl were to be found pregnant during this engagement period, she could be stoned to death. At the very least she had to be divorced either publically or privately. This would have brought incredible shame on the entire family. Saint Joseph was a remarkable man. We devote a great deal of attention to Mary, and well we should. She is the mother of Christ and the mother of the Church. She is the second Eve. She is the most remarkable woman in history! We need to remember that she was the one whom God chose to be the mother of our Lord, and God makes no mistakes. He picked the right girl. While all this is true, we need to remember that God also chose Joseph. God made no mistake in choosing him either. A short tempered man would immediately have had her stoned to death or would have made her a public example by exposing her. But He was not that kind of man. He was a gentle person. He loved and chrished her, and he did not want to hurt her in any way. VS 20 "But while he thought on these things, behold the angel of the Lord appeared to him in his sleep, saying: Joseph, son of David, fear not to take unto thee Mary thy wife, for that which is conceived in her, is of the Holy Ghost." 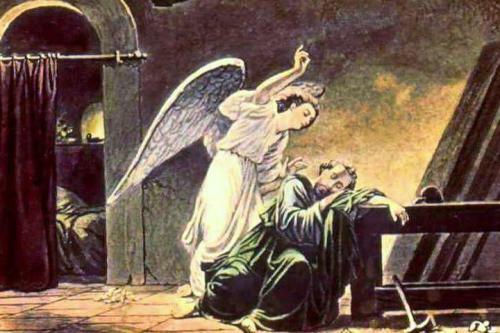 In order to prevent a very tragic situation, the angel appeared to Joseph to make clear to him what was taking place. VS. 21 "And she shall bring forth a son: and thou shalt call his name JESUS. For he shall save his people from their sins." The name Jesus means Saviour. He shall have the name Jesus because he shall save His people from their sins. VS. 22 "Now all this was done that it might be fulfilled which the Lord spoke by the prophet, saying:" St. Matthew, who is writing for the nation of Israel, points out that all this was done so that it might be fulfilled as the Lord had spoken. Matthew is appealing to the nation of Israel to understand that this One who had come must be the fulfillment of the Old Testament Prophecy. It has been said that there are over three hundred prophecies concerning the first coming of Christ that have been literally fulfilled. I don't know how many of them are in Matthew, but I do know that Matthew quoted more from the Old Testament than the other three gospel writers all together. It seems he records things and validates them from the Old Testament because he is primarily showing that this is the fulfillment of the Old Testament prophecies concerning Him. VS 23 "Behold a virgin shall be with child, and bring forth a son, and they shall call his name Emmanuel, which being interpreted is, God with us." Some translations will wrongly use the phrase "young woman" instead of "virgin" in Isaiah 7:14. but if you take a close look at this chapter you will see that they are wrong for doing so. This was during the time when Ahaz was on the throne. He was one of those kings who was far from God, and is usely litsted as one of the bad kings. God sent Isaiah to give a message to him. So we read in Isaiah 7:10-12: "And the Lord spoke again to Achaz, saying: Ask thee a sign of the Lord thy God either unto the depth of hell, or unto the height above. And Achaz said: I will not ask, and I will not tempt the Lord." I believe it was pious hypocrisy for him to say what he did. God had asked Isaiah to meet Ahaz on the way to deliver God's message to him that God wouldgive victory to Ahaz. However, Ahaz wouldn't believe God and so, in order to encourage his faith, Isaiah tells him that God wants to give him a sign. In his super pioua way Ahaz says, "Oh, I wouldn't ask a sign of the Lord." Isaiah answered him, "God is going to give you a sign whether you like it or not. The sign is not just for you but for the whole house of David." Now here is the sign:..."
Obviously, if this refers to a young woman, it would be no sign to Ahaz, or to the house of David, or to anybody else; but if a virgin conceives and bears a son, that would be a sign. And that is what happens in the Gospel of Matthew. Notice something else. VS 23 "Behold a virgin shall be with child, and bring forth a son, and they shall call his name Emmanuel, which being interpreted is, God with us." There is no where in scripture that says Jesus was ever called Emmanuel. He is called Jesus because that is His name. He was given this name because He would save His people from their sins. Christ is His title; Jesus is his name. But is says here that He shall be called "Emmanuel, which being interpreted is, God with us." Here we have one of the most wonderful things in the entire Word of God. Emmanuel means "God with us." He can't be Emmanuel, God with us, unless he is virgin born. That's the only way! And notice , unless He is Emmanuel, He cannot be Jesus the Saviour. The reason they call Him Jesus, Saviour, is because He is God with us. VSS 24-25 "And Joseph rising up from sleep, did as the angel of the Lord had commanded him, and took unto him his wife and he knew her not till she brought forth her firstborn son: and he called his name JESUS"
Those who deny Mary’s perpetual virginity like to point out that in these verses we find two things. One is that she brought forth her FIRSTBORN son. And two Joseph knew her not UNTIL she brought forth her first born child. Two questions arises: If Jesus was Mary’s "firstborn," would there not be at least a second-born? And if "he knew her not till," did he not then "know her" at some point? If we look at Exodus 13:1-2 we see that it reveals something very important about the firstborn in Israel: "The Lord said to Moses, Sanctify unto me every firstborn that openeth the womb among the children of Israel, as well of men as of beasts: for they are all mine." The "firstborn" were not given the title because there was a "second-born." They were called "firstborn" at birth. Jesus being "firstborn" does not require that more siblings be born after him. In Hebrews 2:9 we read: "But we see Jesus, who was made a little lower than the angels, for the suffering of death, crowned with glory and honour: that, through the grace of God, he might taste death for all." He had to be a sacrifice that was acceptable. I couldn't die for the sinsof the world. I can't even die a redemptive death for my own sins. But He can! How can Jesus be a saviour? Because He is Emmanuel, God with us. How did He get with us? He w was virgin born. I say again, He was called Jesus. He was never called Emmanuel. But you can not call Him Jesus unless He is Emmanuel, God with us. He must be Emmanuel to be the Saviour of the world. That is how important the Virgin Birth is.